Purpose built as a hotel over 100 years ago the building retains many of its original features such as fan light windows above doors, central feature stair case and sash and case windows. Our 13 individual bedrooms range from a compact single to a family room for four. Most have en-suite bathrooms while the remaining two have en-suite shower rooms. 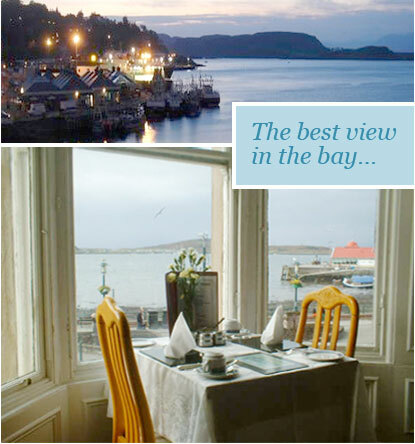 Located on our first floor is our dining room with panoramic views over Oban Bay. Our television/piano lounge is on the second floor where you can also find a wifi hotspot and has a coal effect gas fire to keep you warm in the chilly winter nights. We have a pets welcome policy where guests can take their house trained pets into their bedrooms however pets are not permitted in public areas and must be supervised at all times.